The newest IHG Point Breaks hotels will be bookable today! Every 3-4 months IHG hotels rolls out their PointBreaks list. You can book a room for 5,000 points per night at any of the hotels on the list. The newest list will include IHG point breaks for spring and summer 2017. If you have travel plans for May, June or July this summer, you’ll want to take a look! We’ve stayed at various hotels during point breaks whenever they line up with our travel plans. Often the rooms would otherwise be 15,000 or 20,000 points per night (or more). IHG includes Intercontinental hotels, Crowne Plazas, Holiday Inn & Holiday Inn Expresses, Staybridge Suites, Candlewood Suites and more. Typically, most of the point breaks hotels are at these chains. 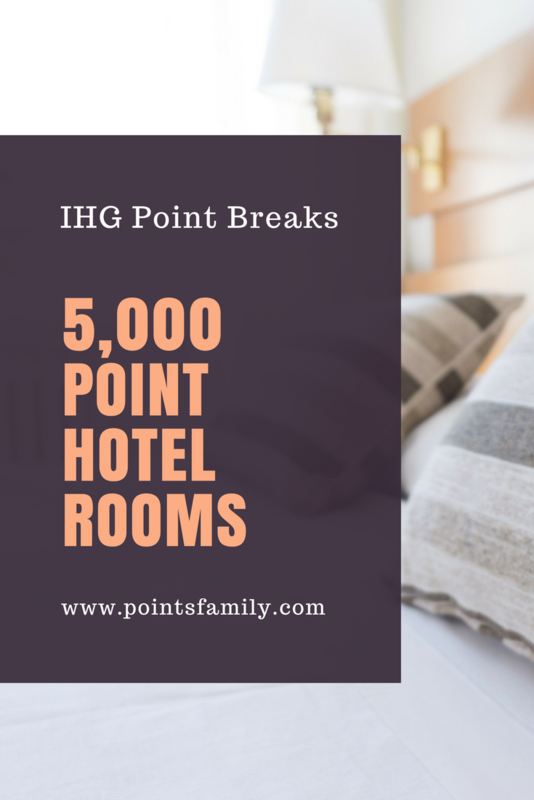 The IHG point breaks nights are bookable at 5,000 points per night, which is the equivalent of $35 per night. The list of IHG Point Breaks hotels will be available from April 24, 2017 – July 31, 2017. The list of hotels doesn’t include all IHG hotels. I scan the list for any hotels that might line up with our travel plans. There are a few hotels that caught my eye. The Florida Lakeland South Holiday Inn Express could be used with the promotion for Legoland Free Kids Ticket When You Buy an Adult Ticket! I also watch for airport hotels. They are perfect for a night before an early morning flight! As I mentioned in the article on TSA Precheck, Chicago O’hare is our go-to airport. That makes the Holiday Inn Chicago O’hare Rosemont a steal! The point break hotels are often in some random locations. However, they are typically great for road trips. We make an annual drive to Colorado and I look at this map from points with crew to see if we can line up an overnight stay. You can only book 2 point breaks reservations for each hotel. Each reservation can be for multiple nights. Book Quickly. Often, the popular hotels on the list will sell out. Once the point breaks hotels are sold out, they won’t release any more nights. If you are interested in anything on the list, I suggest booking right away. Book Speculatively. I often book the point breaks nights speculatively if our plans aren’t firm. You can always cancel the reservation later if your plans don’t work out. Changing Reservations. We were not able to trim a two night stay into a one night stay. We had to give up the point breaks rate. This is something to keep in mind if you are booking without firm plans. 10% Rebate on Points. One of the benefits of the Chase IHG credit card is the 10% rebate on points. 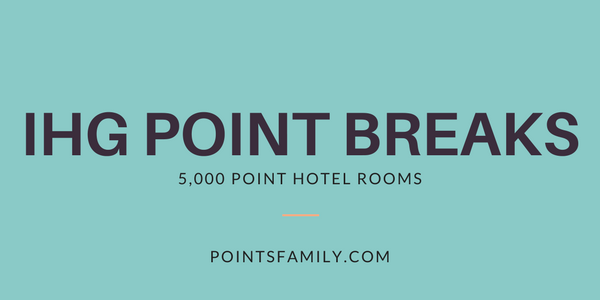 For point breaks hotels, you’ll get a 500 point refund. The actual cost of the nights will be 4,500 points ($30). Sign up Bonus Points. Using the 60,000-80,000 points on the sign up bonus for the Chase card could be worth 13-17 free nights if you redeem them for point breaks hotels! Hopefully, you just finished maximizing the last IHG Accelerate Promotion, and have plenty of points to book! Also see the New Q2 IHG Accelerate Promotion: Register and Maximize. Which hotels on the IHG point breaks list caught your eye?